Helck is the hero that defeated one of the Demon Kings, and in the wake of the Demon King's death, a new one must be declared. This is achieved through a fighting tournament, where the strongest becomes ruler. Vamirio, one of the Great Demon Kings, discovers that Helck is a participant for the tournament and is so far winning! What could be his motive? If a human becomes the next Demon King, what does that spell for the Demon kingdom? When Takuma was a kid, he had an experience involving a mysterious light, but he eventually believed, as all the adults he had told, that it never really happened. He figured he must have gotten reality and imagination mixed up. Now he's a college student, and he has a crush on a philosophy student. One day, a young girl named Sora collides with him from the sky. She seems to have some connection with his past, and claims she is here to expose the lie of the world. In fact, Takuma feels like he can remember two worlds, one where he and the philosophy student were dating, and the current one where they are merely acquaintances. Could it be that the other world is not his imagination, and someone is warping the world for their own ends? Noriyuki Inou is a bright and promising young officer for the JSDF Investigation Division. Among his peers, he is considered especially capable - an expert combatant and highly intelligent operative, though quiet and brooding. His talent is noticed by Hiroaki Nakagou, Chief of the Special Branch for the Tokyo Met Police, and is scouted to join. On his way to meet his sister in Shinjuku for dinner, Inou must run to save her as chaos descends on Shinjuku and it becomes engulfed in explosions and death. What kind of organisation is "Ultra Red"? What is their goal? We follow Inou as he seeks out those responsible for the death of his sister with a burning desire for revenge. For Helck, it's not usually my type of series but I found the comedy enjoyable and was pleasantly surprised when there's a hint at more than a comedy setup, as a main plot seems to creep up on the characters at one point. Although, the plot is still background noise compared to Vamirio and Helck's antics. Helck surprised me with the depth it had for a comedy, and I think will do really well. 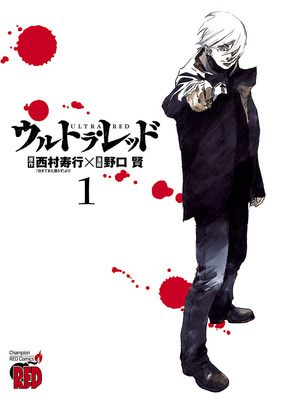 Since Ultra Red is an adaptation of an older novel, it has an old school feel to it and was refreshing to read. Although exaggerated, the setting of political extremism in 70s Japan was quite an interesting one to me, and I think to anyone with a penchant for historical perspective and old school spy thrillers would enjoy it. 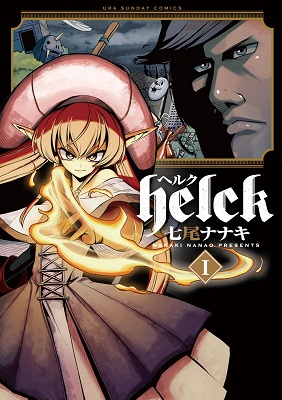 Helck - If you're interested in action adventure type manga with a mix of comedy and demon kings, then you should check this one out. Sora no Aporia - If you like the idea of alternate realities and how someone might manipulate the world to change it to something else, then you should read this manga instead. 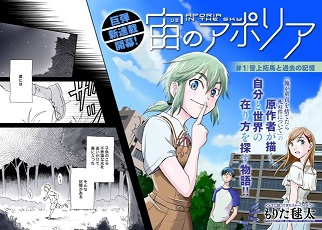 If you haven't done so already, check out the scanlations of the manga from previous shout outs which have been recently scanlated: school life drama Hensokukei Quadrangle (MH link), mysterious drama Bannou Kanteishi Q no Jikenbo (MH link).